I have The Worst Time Ever trying to name hand embroidery designs. It’s a great source of wonderment to me, how designers can repeatedly come up with apt, catchy, or elegant names for embroidery projects, kits, and designs! Or how thread manufacturers can come up with diverse color names that work! When I try to come up with clever and appropriate names for designs or projects, words like thingy, stuff, and whatchamacallit come to mind. Once upon a time, I thought about resorting to a numbering system. Project 1. Project 2. Project 214a. But that would be even worse, wouldn’t it? So I really put my thinking cap on for this design, and I named it Rococo Bud. It’s not necessarily a clever name. But it beats Acanthus-ish Thingamabob. And if you say it ten times fast, it ends up twisting into nonsense words, like ropocobut, which makes it doubly entertaining. Rococo Bud. Rococo, because of the elaborate style. Bud, because it’s kind of opened, kind of closed. How can this particular design be used? Oh, innumerable ways! With a name like Rococo Bud, the first thing that comes to my mind is goldwork. This could be a rather elaborate exercise piece for goldwork! But, other options – whitework! 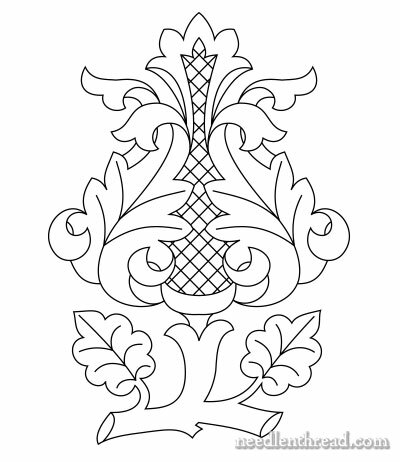 Definitely suitable for a whitework piece that incorporates different layers of texture. Silk shading? Or needlepainting in cotton? Sure! Blackwork? Why not? Outline the elements and fill with different patterns and gradients. Crewel work? Absolutely! With a lattice filling, crewel work makes sense. So, lots of options for Rococo Bud. It’s another one of those designs that’s been on my “To Do” list for a while. I thought I might as well pass it on to you, since I haven’t gotten around to it yet! Maybe you will. Here’s the PDF version that you can download and print from your computer. The design will print at 6″ high, if you choose the “no scaling” option in your print settings. You can also enlarge or reduce it, to suit your purposes. If you’re looking for something to stitch, you can find lots and lots of free hand embroidery patterns here on Needle ‘n Thread. In addition to general patterns for hand embroidery, you’ll find a few counted patterns, some monogram alphabets, a selection of church embroidery patterns, and a group of Hungarian embroidery patterns. Thank you for the lovely design, Mary. I have been wanting to explore goldwork, so this might be the way to begin. Your work is so very beautiful, and so inspiring! Good morning, Mrs. Corbet. I don’t know… I want to like this, but… I don’t think I could do it justice. It looks rather clunky to me, and I have no clue how I could fix it. That said, I’d love to see what more experienced and talented stitchers would do with it! Thank you SO MUCH for your unending generosity. Yes, many thanks for this example and I must say the name you will find him to perfection, Rococo bud is more toned, it reminds me of 1920s, feathers, sequins it is true that I would not mind embroidered with gold, but … white embroidery, it will be as beautiful … I download pronto. Thank you Mary. What a great pattern and a very fitting name. Just had to thank you for giving me a laugh yet AGAIN this morning and I must say your post of a few days ago with the classic Fantasia Hippo happy dance actually brought tears to my eyes! Your blog is the only one I follow daily and your sense of humor, wonderful tutorials and selflessness help to motivate me to have creative and productive days. Shucks. Thanks, Kerry!! Always glad to hear someone else in the world is smiling, too! Now you’ve done it. “Ropocobut” is going to stick in my brain. It makes no sense and yet is quite memorable. Love the lattice work up the center. The leafy petals do offer a lot of options. So happy to see the “pin” option there as well. What a lovely thingy, stuff, whatchamacallit Acanthus-ish Thingamabob, ropocobut, I mean, em, Rocco Bud I’m glad you didn’t name it project 1,2, etc. The leaves and lattice work are really pretty and as you say there are lots of ways you could embroider this. Thanks for your hard work in giving this design such an appropriate name and thanks for sharing this with us, so that we can enjoy thinking of ways to embroider it. I hope you have a springy, stitchy weekend. SHHHHHH OK I won’t speak. Thanks, Mary, for the beautiful pattern, I like your sense of humor too! It’s lovely, thank you. I need to practice everything on some small projects. For some reason my stitches don’t look as nice as yours! It seems like I’m always threading needles. I’m thinking of threading 3 needles of each green combination before I pick up the hummingbirds again. Do you ever do that? It is such a sweet pattern and I think I will be using some of my crewel wool on this for sure ! Many thanks ! I’ve been following your blog daily since I discovered it almost a year ago. I don’t know how you can think of something to write about every day. It is impressive. You are the only stitch blogger that I’ve discovered who is so consistent. PLUS your entries are full of helpful and interesting information that is quite varied in topic. AND you are so generous in sharing patterns and video clips. Thank you for making me smile often and for helping me become a better stitcher always. Another beautiful pattern. Thank you! I am so amazed that you can do all this beautiful stitching and pattern designing and everything else PLUS photograph it PLUS blog about it extensively every single day! If I could manage that once a week or once a month, I’d be pretty proud. I look forward to your lovely updates every day. So inspiring! I just want to stitch (but I’m finishing up an applique quilt before I get back into embroidery). I wanted to print the designs but it did not com. Please send the designs to my mail. Mary, as a new one to your site and a beginner in embroidery, I have little imagination as to color for prints such as the above. Is it possible to include suggestions as to color threads to use? Thanks for the wonderful help you provide me. Hi, Connie – Well, the problem is, if I worked out color schemes and stitch schemes for each pattern I post, I really couldn’t get anything else done. The best thing to do, I think, is to sit down with the pattern (maybe several copies of it?) and some colored pencils, and see if you can work out a scheme you like. Color is a funny thing – I might envision certain colors for a particular pattern, and yet, you might dislike them very much! Color preferences are fairly personal, when it comes to stylized designs like this. It’s not like embroidering a bird or a flower that, in nature, already has certain colors assigned to it. In any case, if I were working this particular piece, I’d go for greens on the outside (shaded – and possibly some golds, if I weren’t doing it in goldwork) and then the inside, I’d go for a vibrant gradation of reds, probably, because I’m a red person. Then I’d couch over the red with some contrasting color. I could also see it in purples, corals, something like that. But the leaves, the branch – I’d probably go with the standard greens (shaded) with browns and golds. Thank you so much for sharing this beautiful pattern! I’ve never tried goldwork before but this pattern screems to be embroidered in gold. I am definitly going to make this one and show you a picture when I am done. Oh, good, Nancy! I’ll look forward to seeing it! Next Next post: Searching for Schwalm Whitework?